To display Foursquare login button, you have to enable the option Enable Foursquare Login that you can find in the plugin option panel. 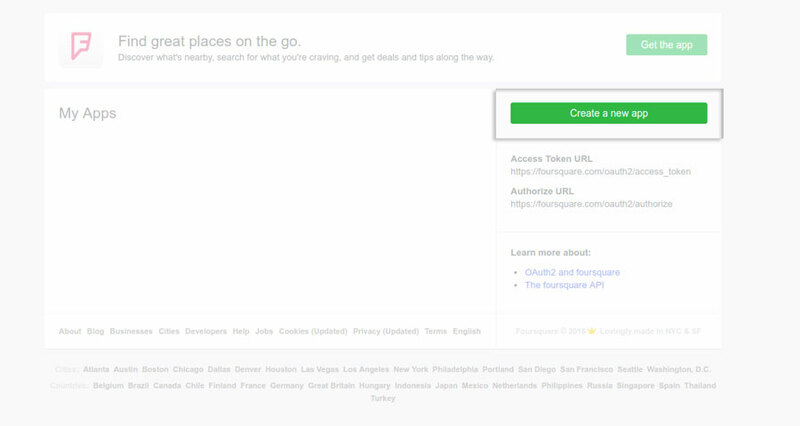 Register at Foursquare and go to https://www.foursquare.com/oauth/ to create the application necessary to enable social login through Foursquare. Click on “Create new app”. Fill out the form with all required data and be careful you do not forget to type the domain that hosts your site in Download / welcome page url. If the form has been filled out correctly, you will be redirected to the application page, where you will find credentials required in the plugin, that is Consumer Key and Secret Key. In case you were not redirected to the right page, you can find the application just created here. If you want to customise the social network icon, just upload the image you have chosen through the specifi option, Foursquare Icon, that you can find in the plugin section called “Foursquare”.